For the former Jiahe County in Zhejiang, see Jiaxing. Jiahe County (simplified Chinese: 嘉禾县; traditional Chinese: 嘉禾縣; pinyin: Jiāhé Xiàn) is a county in Hunan Province, China, it is under the administration of Chenzhou prefecture-level City. Located on the southern part of the province and the west of Chenzhou, the county is bordered to the northwest by Xintian County, to the east and northeast by Guiyang County, to the south by Linwu County, to the west by Lanshan and Ningyuan Counties. Jiahe County covers 699.05 km2 (269.90 sq mi), as of 2015, It had a registered population of 423,900 and a resident population of 317,300. 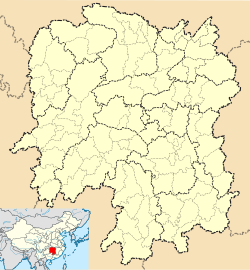 The county has 9 towns and a township under its jurisdiction, the county seat is Zhuquan (珠泉镇). ^ Google (2014-07-02). "Jiahe" (Map). Google Maps. Google. Retrieved 2014-07-02. ^ "中国地面气候标准值月值(1981-2010)" (in Chinese). China Meteorological Data Service Center. Retrieved 20 October 2018.